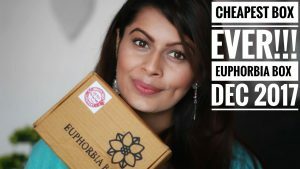 Honestly speaking, I had heard so many bad reviews about Huggies Diaper quality in India that I never purchased them 😏. The reason I ended up having this pack is because I sent my husband to buy diapers one day, and he happily brought these home. Since we had our air tickets booked for the same day, I did not get the opportunity to get them replaced. Product claims: Total protection range is a higher-end product from Huggies. The package claims to be clinically proven for rash prevention. 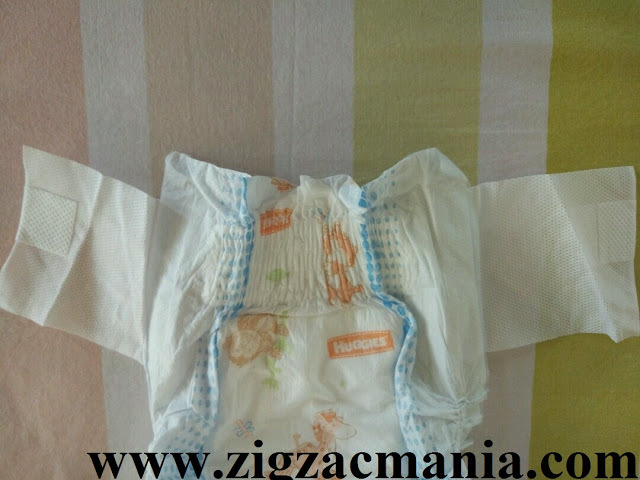 They highlight on three features of this product: long lasting dryness because of the quick-dry layer, uniform spread of liquid and the super absorbent gel; the air-fresh cover that allows the movement of air through the diaper; and the waistband finish at the back, that prevents redness due to friction and provides a snug fit. The appearance of the diaper: The diaper comes with a bright animal print, and the outer texture looks great. I immediately compared it to the print of a Pampers baby dry diaper of the same size, and was impressed with the better appearance of Huggies. 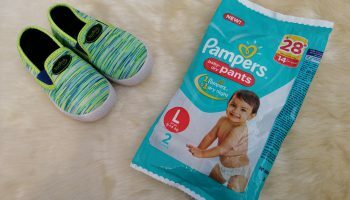 Overall, the dimensions of both the diapers were similar, but the Pamper’s diaper was slightly thinner and lighter in weight. 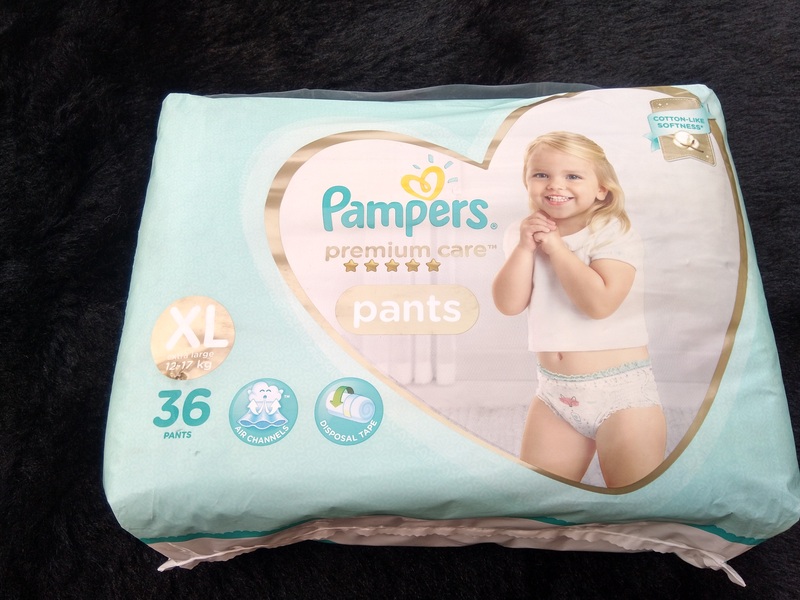 On opening the packaging, there was not much difference between Pampers and Huggies, except for the color (Huggies being blue and Pampers being green), and the texture of the side tapes. 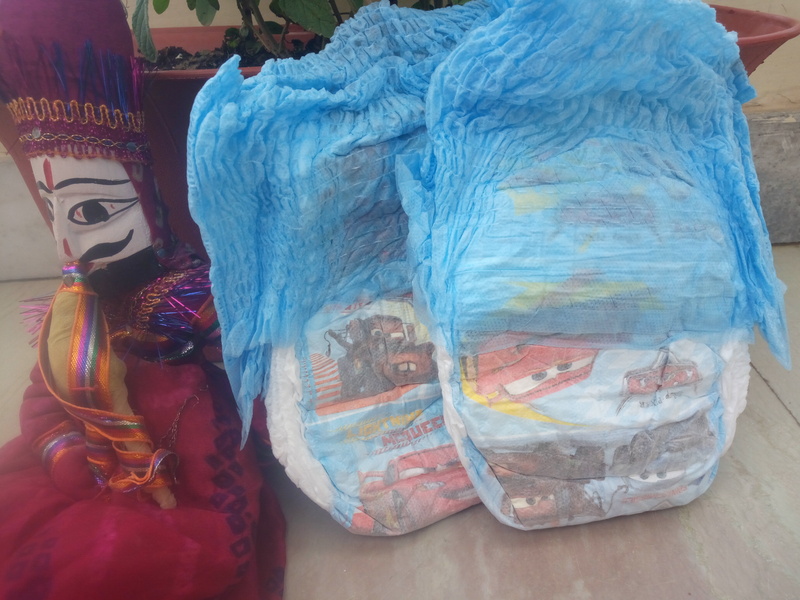 Both the products had a quick-dry layer patch of the same size (in the picture, the Pampers diaper is fully opened but the Huggies diaper is not), and the feel of both the diapers was similar. 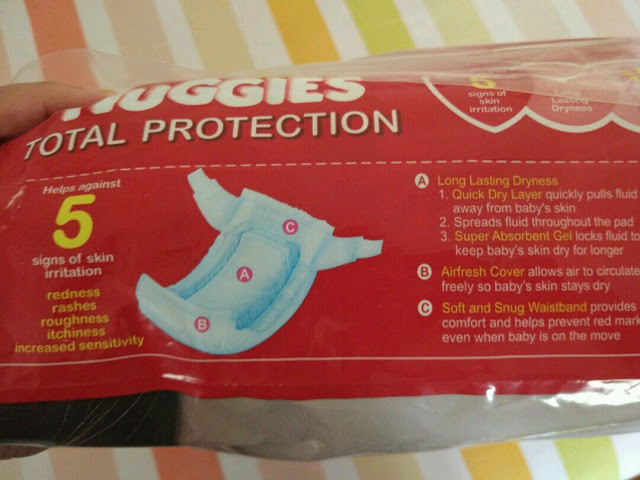 Another difference between the two brands is that Huggies diapers are mildly scented, as it was the case with Total Protection diaper. Personally, I don’t like the diapers to be scented, but it is a matter of personal choice. Scented diapers are believed to neutralize the urine odor and keep the baby fresh. The major difference between the two diapers was their back side. The unique feature of Huggies Total Protection diapers is indeed the waistband at the back, it truly fits better on the baby. 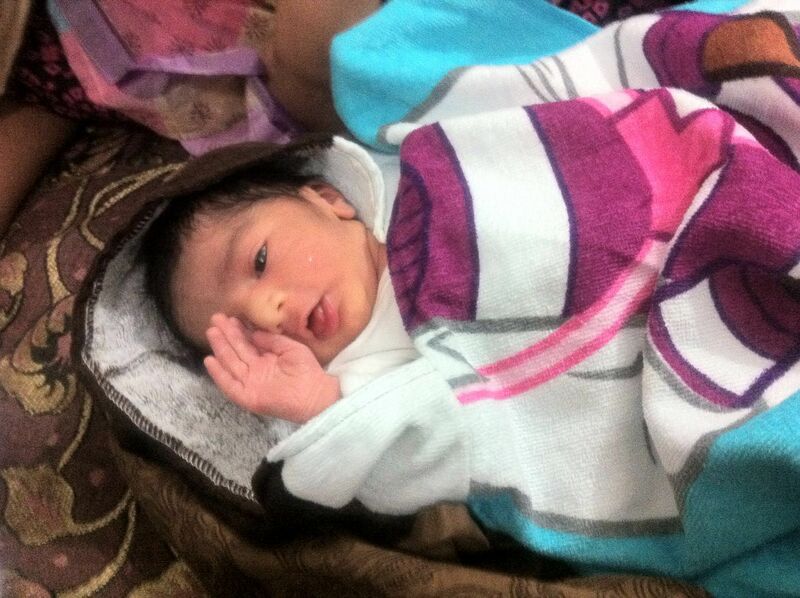 The band is very soft, so that the baby does not feel any friction even after overnight use. 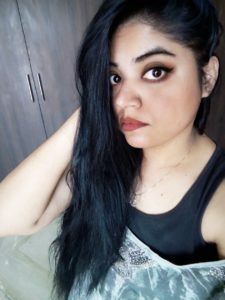 However, Pampers diaper is very soft at the back, and though the fit is not as snug as Huggies Total Protection diaper, I have never faced any redness on my baby’s back due to the diaper. So, the waistband cannot be taken as an advantage, although it definitely gives a better snug fit. Absorbency: The most important aspect of the diaper is its absorbency. I used Huggies Total Protection diapers for overnight usage for a week, and was happy with its absorbency. The claim of uniform spread of the liquid, however, could not be verified because my son woke up due to major gel absorption at the front. This could be due to the fact that my son usually sleeps on his tummy. Therefore, I can neither confirm, nor refute this claim. 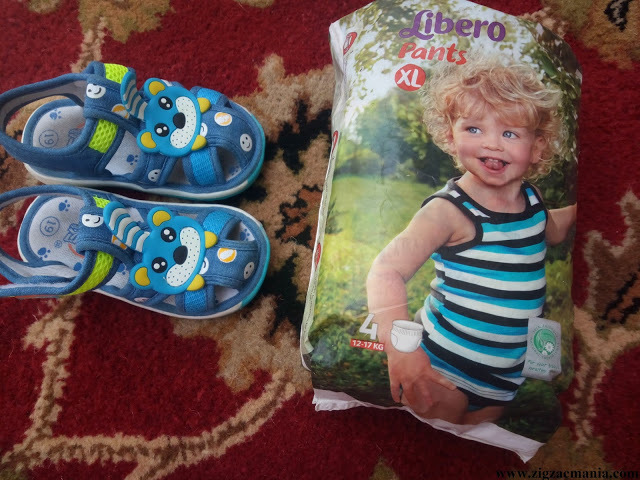 The most important experience of using Huggies Total Protection diapers was that my son did not develop a rash throughout the week we used it. I can say that the diaper holds 5 to 6 pee count fairly well. Final verdict: I was happy with Huggies Total Protection diaper, mainly because it worked well for overnight use and never lead to rashes. However, I strongly suggest using a diaper rash cream everytime we change diaper for the baby 👶 and I particularly never use any diaper without the cream. 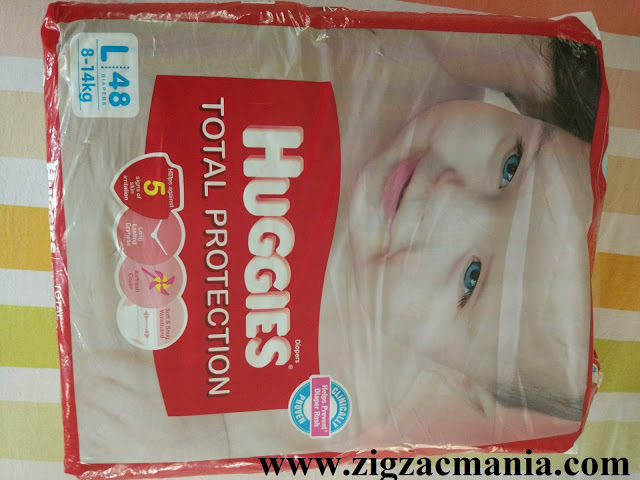 For dedicated users of Pampers (like me), Huggies Total protection range is a good alternative if one has to buy another brand for some reason. The waistband is a unique feature, but does not add much to the performance of the diaper, except for a better fit. 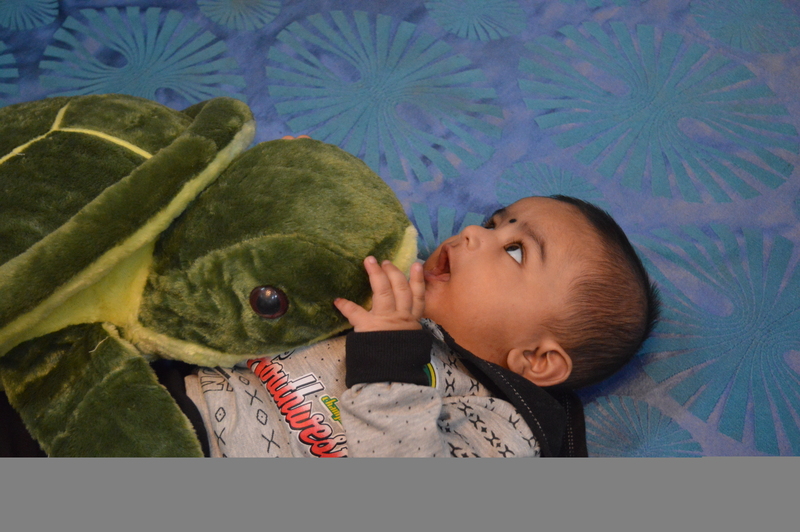 It may be useful for toddlers who crawl a lot and tend to displace the diapers. If you do not get bothered by scented diapers and are looking for a fairly good replacement , you may give Huggies Total Protection a try. Nicely reviewed. it's really a good diaper.